SpaceWorks Enterprises, Inc. (SEI) has released their annual nanosatellite and microsatellite market forecast — this 9th edition of the report details the latest observations and trends in the smallsat market. Projections indicate as many as 2,800 nano/microsatellites will require launch over the next five years. SpaceWorks analysts projects between 294 to 393 smallsats (1 to 50 kg.) will launch globally in 2019, an 18 percent increase over last year. Of the 262 spacecraft SpaceWorks predicted to launch in 2018, 253 actually launched. 2019 projections remain strong and have been updated to reflect the advancements of dedicated smallsat launch vehicles, changing attitudes of civil and military operators, and the rapid progress of commercial satellite IoT ventures. SpaceWorks analysts continue to gain confidence in the small satellite market as operators begin promising less and delivering more. 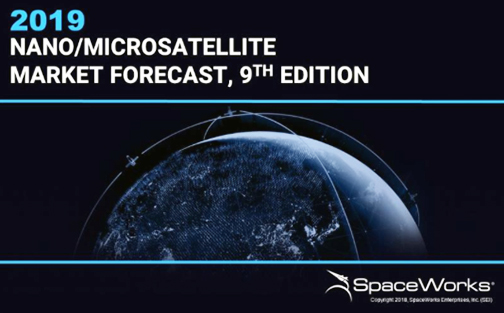 The Nano/Microsatellite Market Forecast, 9th Edition by SpaceWorks shows that annual smallsat launches have grown by more than 150 percent during the last 5 years. Analysis of development trends by operator type show that the commercial sector continues to rule the industry, even in the face of re-surging interest from civil operators. Analysis of trends by application indicate that Communications will make up more than 20 percent of nano/microsatellites launched in the next five years, decreasing the Earth Observation (EO) and Remote Sensing sector's dominant position by as much as 15 percent market share. Since 2008, SpaceWorks has actively monitored global economic activity in the space sector to provide the company's clients with insights into the changing space market landscape. SpaceWorks internally maintains a broad Launch Demand Database (LDDB) to track all historical and future satellites and their characteristics, which serves as the basis for SpaceWorks satellite market assessments. Currently, SpaceWorks is tracking 75+ planned constellations and 250+ unique smallsats in various stages of development that are expected to launch within the next five years. SpaceWorks routinely completes economic analysis and strategic advisory engagements for customers across the industry to help clients understand the competitive market forces at play and enable them to make sound strategic investment decisions. The report is available in presentation form as a free download on the website http://www.spaceworks.aero/insights. Caleb Williams, Lead Economic Analyst at SpaceWorks, said the company showed unprecedented accuracy in last year's forecast, with the firm's prediction coming within 5 percent of actual nano/microsatellites launched. Changes to the firm's forecasting methodology, in combination with greater launch consistency and better execution on the part of smallsat operators contributed to the company's ability to accurately forecast market growth. Stephanie DelPozzo, SpaceWorks Economic Analyst, added that the rapid progress of operators focusing on IoT applications is expected to continue and communications applications are expected to quadruple their market share over the next five years. Overall, the maturing capabilities of smallsats are expected to open additional opportunities for growth and keep investors interested in the market during the near-term. For your consideration: the premier smallsat networking event — the SmallSat Symposium — is now less than one week away from starting at the Computer History Museum in Silicon Valley.